New smart streetlights have already saved enough energy to power almost every home in Bagshot for a year. All 88,000 streetlights have now been replaced or upgraded by Surrey County Council as part of one of Britain’s biggest roll-outs of energy-efficient technology. The project, which has been completed a year ahead of schedule, has swapped Surrey’s night time orange glow for the clarity of brighter white lights. Since the replacement programme was launched four years ago the amount of energy used has been slashed by seven million kilowatt hours. That is enough to power more than 2,100 typical homes for a year using an average amount of electricity*. It means the county council has cut its energy bill by £500,000 over the same period. The project will save around £12 million over 25 years through energy savings and a better contract deal while also reducing light pollution because the new lamps direct their beam downwards. Each lamp can be controlled by computer, which means street lighting can be increased when it is needed and reduced when it is not – for example, as the sun begins to rise in the morning or sets at night at different times of the year. Even with reduced lighting, the new lamps are still clearer than the previous orange glow. 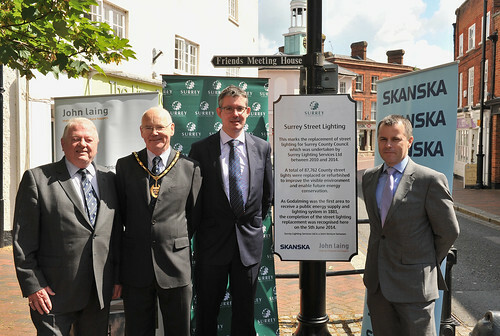 Surrey County Council’s Cabinet Member for Highways and Transport John Furey said: “These lights are good for the pocket and the environment – saving £500,000 and enough energy to power Bagshot’s 2,100 homes for a year demonstrates that. * According to Ofgem. There are 2,300 homes in Bagshot according to the 2011 Census.